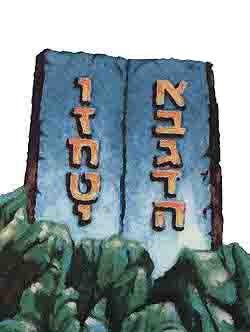 Almost everyone has heard of the Ten Commandments, and many can name at least three or four; in fact, there must be a good few million who can list all ten, in order. Less common, however, is the knowledge that this 10-point encapsulation of G‑d's message to man reads in two directions: from top to bottom, and from side to side. This means that, in essence, there are only five Commandments. "Do not kill" is another way of saying "I am the L‑rd your G‑d"; the prohibition against adultery is the prohibition against idolatry; keeping Shabbat means being a truthful witness; and so on. What is this analogous to? To a king of flesh and blood who entered a country and put up portraits of himself, and made statues of himself, and minted coins with his image. After a while, the people of the country overturned his portraits, broke his statues and invalidated his coins, thereby reducing the image of the king. So, too, one who sheds blood reduces the image of the King, as it is written (Genesis 9:6): "One who spills a man's blood... for in the image of G‑d He made man." Now there are murderers who say they believe in G‑d. And there are people who are dead-set against murder who claim not to believe in a higher power. They're both wrong. If you truly believe in G‑d, you are incapable of murder. And if you truly believe that taking the life of another human is wrong — not just because you lack the means or motive to do so or are afraid of ending up in jail, but because you recognize the transcendent, inviolable value of life — that's just another way of saying you believe in G‑d. Even if you're not one of those religious types who put it in those terms. Love the Lord our G-d with all your heart, with all your soul and with all your mind, and love your neighbor as you love yourself. That encloses the whole Torah. If you cannot love your neighbor who you see, how can you love G-d who you don't see? Kill should be switched Murder. To Murder or to Kill Murdering and killing are not the same! In Hebrew, it is stated Lo Tirzach, which means do not murder. Retzach is murder! teacher by "Anonymous" Are you just a sponge that absorbs mindlessly? Whatever one teaches should be scrutinized by the listener. This is called using your intelligence. Radical Muslim imams teach that Jews are descendents of apes and pigs. Does it follow that just because he is "teaching" that he is correct and that we aught to accept his "teachings" as truth? How can one learn if one only absorbs and does not think about what he is "learning". Again, words have meaning, and before we teach or learn, we should use the words as they were meant, and said, originally. "Why is "Do not kill" the flip side of "I am the L‑rd your G‑d"? Because, say the Sages, to murder a fellow man is to murder G‑d:"
The 3rd Commandment Actually, this is not a comment but a question. What about the 3rd commandment? How is it related to 8th commandment, and also the rest of it? I was looking for a further explanations about the 4th to the 9th and the 5th to the last but I couldn't find it. I am hoping that you can explain these to me because it's really interesting how you explained the 1st and the 2nd commandment. 'Hope to hear from you soon! Why not like this: I see more continuity this way. Mitzvas Actually, I am sorry I didn't stick to the topic- just posting "food" for thought, and thoughts about food. The interest was in the origin of making the kill a Sabbath mitzvah!I meant, according to Piny the Elder, that originally, Egyptian Habiru did not eat too well. to Morton (mitzvahs and cleanliness) Actually, I have never heard this idea (meat on the Sabbath) and I presume that this tended to cover those in the early days whose diet was principally figs, because they were slaves, such that they were permitted protein for holy reasons (by arbiting legislation).